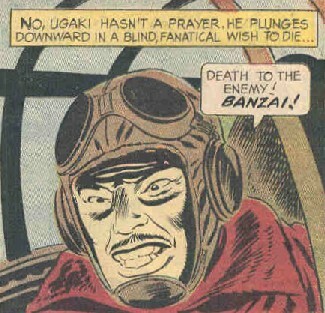 A limited number of English-language comic books have stories about kamikaze pilots, but these comics often leave readers with distorted images of historical events and people. For example, the frame at right from a 1967 comic in Ripley's Believe It or Not! shows Vice Admiral Matome Ugaki, who made the last kamikaze attack of the war after he heard the Emperor's surrender message on the radio. The comic artist shows him cross-eyed, gritting his teeth, and with light yellowish-green skin. Historical photos show him as a calm, distinguished leader, and his detailed diary kept during the war does not suggest he had "a blind, fanatical wish to die" as stated in the comic. The comics reviewed in this section contain many historical errors, but the writer of Authentic War Stories provides a thoughtful examination of people's differing views toward kamikaze attacks.